For other uses, see Mush (disambiguation). Mushing is a sport or transport method powered by dogs. It includes carting, pulka, dog scootering, sled dog racing, skijoring, freighting, and weight pulling. More specifically, it implies the use of one or more dogs to pull a sled on snow or a rig on dry land. France was the first European power established in the Canadian Shield; accordingly, the coureurs des bois and the voyageurs of New France used the French word marche!, meaning "walk" or "move", to command to the team to commence pulling. Marche! became "mush!" for English Canadians. "Mush!" is rarely used in modern parlance. The practice of using dogs to pull sleds dates back to at least 2000 BC. It originated in Siberia or North America, where many American Indian cultures used dogs to pull loads. In 1534, Jacques Cartier discovered the Gaspé Peninsula and claimed the land in the name of Francis I of France. For the better part of a century the Iroquois and French clashed in a series of attacks and reprisals. That is why Samuel de Champlain arranged to have young French men live with the natives, to learn their language and customs and help the French adapt to life in North America. These men, known as coureurs des bois (runners of the woods), were the first European mushers in North America, extended French influence south and west and in 1609, New France controlled all the Canadian Shield. In 1680, the intendant of New France, Jacques Duchesneau de la Doussinière et d'Ambault, estimated that there was not one family in New France who did not have a "son, brother, uncle or nephew" among the coureurs des bois. During the winter, sled became the ordinary transportation in the north of New France. In 1760, the British Army completed the conquest of Canada and gained control of the Canadian Shield. Many coureurs des bois accepted British rule and continued to use the sled dog. The French term Marche! became Mush! in English. During the Klondike Gold Rush, many prospectors came in the Yukon with sled dogs. This "Last Great Gold Rush" has been immortalized by American author Jack London in The Call of the Wild. Sled-dog became the common mode of transportation in Yukon and in the new US Territory of Alaska. In 1911, Norwegian explorer Roald Amundsen used sled dogs in a race to become the first person to reach the South Pole. He succeeded, while his competitor Robert Falcon Scott, who had instead used Siberian ponies, tragically perished. By the time of the First World War, mushing had spread to European countries such as Norway, where dog sleds were used for nature tours, as ambulances in the woodlands and mountains, and to bring supplies to soldiers in the field. During the 1925 serum run to Nome, 20 mushers and about 150 sled dogs relayed diphtheria antitoxin 674 miles (1,085 km) by dog sled across the U.S. territory of Alaska in five and a half days, saving the small city of Nome and the surrounding communities from an incipient epidemic. Although dogsled racing gets more publicity and is seen now as the primary form of mushing, recreational mushing thrives as an unorganized sport providing healthy outdoor form of winter exercise for families. Mushing for utilitarian purposes includes anything from hauling wood or delivering milk or the mail to rural travel and equipment hauling. Dogs have been replaced by snowmobiles in many places, but some trappers and other isolated users have gone back to sled dogs, finding them safer and more dependable in extreme weather conditions. Dog team members are given titles according to their position in the team relative to the sled. These include leaders or lead dogs, swing dogs, team dogs, and wheelers or wheel dogs. Lead dogs steer the rest of the team and set the pace. Leaders may be single or double; the latter is more common now, though single leaders used to be more common during the mid-20th century. Sometimes a leader may be unhitched (a loose or free leader) to find the trail for the rest of the team, but the practice is uncommon and is not allowed at races. Qualities for a good lead dog are intelligence, initiative, common sense, and the ability to find a trail in bad conditions. Team dogs are those between the wheelers and the swing dogs, and add power to the team. A small team may not have dogs in this position. Alternatively, the term may be used to describe any dog in a dog team. Wheel dogs are those nearest the sled and musher, and a good wheeler must have a relatively calm temperament so as not to be startled by the sled moving just behind it. Strength, steadiness, and ability to help guide the sled around tight curves are qualities valued in "wheelers." 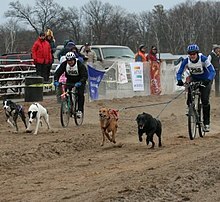 Bikejoring is dog mushing similar to skijoring, canicross, and dog scootering. A dog or team of dogs attached to a towline a bicycle. Bikejoring is a non-snow season, or dryland, activity. Bikejoring and canicross probably developed from skijoring and dogsled racing. Bikejoring is also sometimes used to train racing sled-dogs out of season. 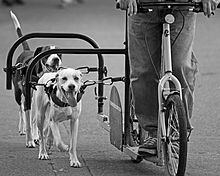 An easier and maybe safer alternative to bikejoring or dog-scootering, especially for use in urban and built up areas, is to attach a dog to the side of a bicycle using a number of designed dog-bicycle attachments. However, these patented side attachments are designed to allow a dog to run beside a bicycle, rather than to pull it from ahead. These patented dog-bike attachments usually include some sort of shock absorption, usually a spring. Some of these side attachments can be fitted either side of a bicycle so that two dogs can be exercised at the same time. 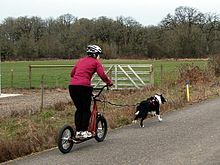 Examples of these dog-bicycle attachments are the WalkyDog, Springer, bikejor converter and more recently the bikejoring attachment. Dog scootering uses one or more dogs to pull a human riding an unmotorized kick scooter. It is similar to mushing, which is done in the winter, but generally with fewer dogs and with a scooter instead of a dogsled. The dogs wear the same harnesses that sled dogs wear, and are hooked to the scooter with a gangline. The gangline usually incorporates a bungee cord to smooth out the shocks of speeding up and takeoff. Dog scooterers get together for fun runs, where a number of dog scooterers run their dogs and scooters on the same trails. Fun runs may be just a morning run, or can be a weekend-long activity with multiple runs scheduled. This is still a maturing activity, but there are a few formal dog races that include scooter events. ^ Discovering Denali: A Complete Reference Guide to Denali National Park and Mount McKinley, Alaska - Dow Scoggins - iUniverse - 2004 - ISBN 0595750583, 9780595750580 - p. 137 - Mush : This term is a misuse of the French word "marche" ("to go"). Dog mushers heard the French Canadian trappers using the word marche to make their dogs run. They interpreted it as "mush". ^ White, Tim. "A History of Mushing Before We Knew It". International Federation of Sleddog Sports, Inc. Retrieved 2012-10-21. ^ Riendeau, Roger E (2007). A brief history of Canada. Facts on File, cop. p. 36. ISBN 978-0-8160-6335-2. Retrieved 2010-08-11. ^ Dictionnaire Universel De Commerce: Contenant Tout Ce Qui Concerne Le Commerce Qui Se Fait Dans Les Quatre Parties Du Monde ... L'Explication De Tous Les Termes, Qui Ont Rapport Au Negoce, Les Monnoyes De Compte .... A - E by Jacques Savary des Bruslons, Philémon-Louis Savary, 1723 - "C'est avec ces canots, qui sont construits d'écorces de bouleau que se fait tout le Commerce du grand fleuve & des lacs, pendant l'été. En hyver, on se sert de traîneaux tirez par des chevaux ou par des chiens; & c'est la voiture ordinaire pour aller de Quebec à Mont-real pendant cette saison, lorsque la riviere de S. Laurent est glacée." Translation in English : "It is with canoes, which are built of birch bark that is done all the trade of the great river and lakes during the summer. During winter, we use sleds pulled by horses or dogs, it is the ordinary car to go from Quebec to Montreal when the river St. Lawrence is frozen." ^ "Roald Amundsen". PBS Online. Retrieved 2012-10-21. ^ Myhre, Knut. "Nordic Dogsledding in Scandinavia". International Federation of Sleddog Sports, Inc. Retrieved 2012-10-21. This page was last edited on 15 February 2019, at 14:07 (UTC).